ACME guest John Derrick West drops some knowledge and laughs during a guest spot on Brian Augustyn’s video-cast “The Comic Book Insider”. Derrick joins the fun around the 1:11 minute mark. Available at the two ACME events in May, this print of MONSTROS by Scott Godlewski is a great way to support a great cause. Limited to only 50 prints, all proceeds will go towards The HERO Initiative. 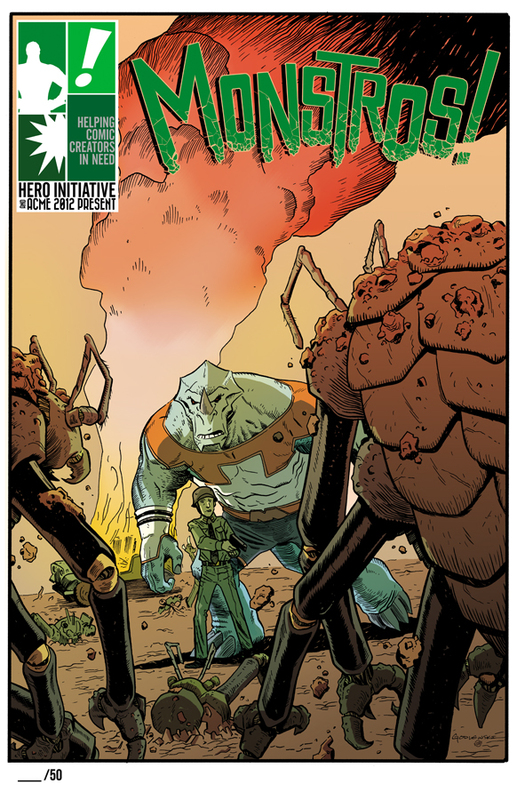 HERO is a wonderful charity who helps out comic creators in times of need. Often in this business health insurance is hard to come by so whenever a comic veteran needs help with medical bills, or even basic necessities, HERO is there to help out. For only $10 you can get this limited edition print and get it signed by both Scott and Ryan Cody. So please, come by the ACME Art Show May 4th at Gotham City Comics & Coffee or the main ACME event May 5th at Samurai Comics in Mesa and pick one up. Brian Augustyn has had to cancel his ACME Appearance. But you can see see him at Gotham City Comics & Coffee on May 5th! We have also added a couple great artists in Val Hochberg and Armand Villavert! Please see the Guest page for more info on Val and Armand!